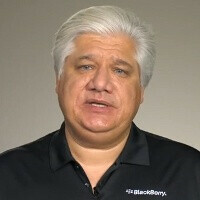 UPDATE: And just like that all BlackBerry services have been restored, Mike Lazaridis confirmed now. The backlog of messages after the three-day outage has been cleared as well. Some of you have noticed that across various parts of the world BlackBerry services have been down in the last couple of days. RIM has officially acknowledged the issue and now co-CEO Mike Lazaridis has even recorded an apologetic video saying that the company hasn’t lived up to expectations. But RIM will try its best in the future, Lazaridis promised. The apology though didn’t bring any certainty about when is the service going to fully recover. “I apologize for the service outages this week. We've let many of you down. But let me assure you that we're working around the clock to fix this. You expect better from us, and I expect better from us,” Lazaridis added. It all began on Monday with a failure in RIM’s European center in England. Then the company purposefully slowed down traffic to deliver the backlog of messages that had formed. Users in Canada and Europe reported about hours of delay for receiving emails and messages. In Wednesday the situation started to get out of control affecting RIM’s biggest corporate customers in North America and then spreading to Asia. Today, the issue has started to resolve slowly in North America, but we’re yet to see it completely fixed. At the same time, it’s unclear what damages this has caused to the Canadian phone maker. There was no worse time for this to happen as RIM is undergoing a hard transition to its upcoming QNX-based mobile OS. At the same time, carriers in different countries have issued statements that they will reimburse users with a couple of days of free usage. Has the BlackBerry service outage affected you? Feel free to share your experiences in the comments below. I always wonder if these personal apologies actually do anything to change the consumer's perception of the company. If the only people who watch things like these are gadget enthusiasts, then they are apologizing the the vast minority of their users. Kind of like the CEO of Netflix apologizing. But then again, it gives something for the media to pick up and distribute as well... I'm not sure what's going on with RIM nowadays. Seems like things keep getting worse for them...and it's their own fault. A personal message is always appreciated. I think most BB users would hear about it from word of mouth than watching the video. A personal appology from the CEO for a mistake is always better than a "its your fault, your holding it wrong" speech from the CEO when they make a mistake. the point of bringing up antennagate was to show that there are 2 ways to solve a problem. bow your head and appologize, or strike back at your own clients while pointing fingers at them . That good will that an apology creates goes a long way. Sprint did it a few years ago when Hesse took over and he turned the titanic into something that looks like its about to finally have some real turn around. RIM doesnt have the fanaticism that Apple has.. they could never get away with doing what Steve Jobs did. They would never get that "pass" from people. I still cannot believe that isheep would defend Apple about the antennagate. They need to accept the fact that Apple screwed up instead of saying "You are right! it's our fault for holding the phone wrong!" Apple screwed up big time and they should have apologized, but that of course is not Apple's style anymore. It's we are perfect, we don't make mistakes, our designs in our devices are flawless. I lost a lot of respect for Apple after that bullcrap happened. I use to love apple and love their products, but when someone screws up, they have to be mature and act like an adult and admit it. Not try to cover it up or blame it on someone else. So yes here we go again but it is damn true. Good for the CEO for apologizing for the outage instead of saying "yes its your fault, you are in a bad coverage area, move somewhere else". the main different from RIM and apple were apple product were not lame (not the best, but still acceptable), while RIM product were bad, outdated, and have the wrong technology. So, would you rather have no apology from RIM? I was really just wondering the effectiveness of things like this. Apologies from videos on YouTube or blog entries by company CEOs. I wasn't saying that apologizing was a bad thing or even that the video was a waste. I wondered what you guys though...but three thumbs down means no one wants to really talk about that...oh well. I think things would be worse if there were no apology. I expect any service to be available only up to 99.9% of the time (or around there). In any case, I don't expect 100% up time. This particular outage lasted longer than I feel is reasonable or expected and it affected a great many people. For such a major outage, I welcome an apology from someone high up. the CEO doing his best for his company. But I think the damage might cost 10%-20% of their userbase. If this trouble come again in less than a week, then RIM would be bankrupt in no time. Outages like this is one reason I moved away Blackberry devices. There are others like email size limit, slow OS & reboot, and older hardware. However, for some reason some people believe all the BS they sling about there phones. But then again that could be said about other phones. Yeah I moved away from them too, I remember in 2009 there was an outage and there was no apology for it. And these outages keep happening more and more often. I wonder what keep the rest of bbers on this platform. Why don't they move to android, nokia or iphone??? Living in South Africa, where BlackBerry has almost 2 million customers, it was pandemonium during the last 3 days- no BBM, no emails, no phone browsers working. One had to either use a non-BB or change wap settings for apps such as UberSocial to work. I for one was using Opera Mini on my BB- and that gobbled up a helluva lot of my airtime. It was a very long 3 days and I hope RIM has this fixed otherwise these 2 million people are buying Androids and iPhones. you were stupid enough if you still using BB. Sell the devices now and change to android, nokia, iphones while the devices still have value. I mean NOW!!!! I hate to say it but you may be right. It seems like RIM these days just can't get anything right. Something has got to give! I agree, they continue to stay behind while iOS and especially Android out do them at all the time. RIM keeps banking on their enterprise service but that won't hold them for long as people keep migrating away from Blackberry phones. If a service in England went down... why would it affect the whole world? As long as you're not getting communications from England I would think you'd be ok.
i believe all emails and bb stuff goes to one server. so if the server is down everyone will be affected even if you are in another planet. i might be wrong though. that's because RIM either stupid or control freak by making a giant AOL-style internet on mobile devices. R.I.P. RIM Blackberry. Nuff said. I can't help but to feel sorry for RIM. But for the most part, these wounds are all self inflicted. Well, i am a BB user 2 years ago and i am happy to use it. I appreciate the fact that M Lazaridis apologized for this mess, because that was a mess for 2 days here in Europe, but it's stg that could happen to every company, no doubt... Finally, I expect RIM to try more at new QNX OS ! Good luck then. I hope you can be happy not being able to browse the internet while others can. Blackberry is doomed. If they dont get rid of their idiot co-ceo's that started the company within 2 years, I'll give them about 3 or 4 to live. The sooner they get rid of them the sooner they can return to profit. The only thing they've done remotely right in the last 3 years was the Playbook, which arguably is the best tablet OS on the market. However, the device is underpowered and was overcharged, and the lack of luring developers is really hurting them on this front, nobody is going to buy a tablet with a scant couple of thousand apps when they can get an Android with tens of thousands and iPad with hundreds of thousands, and the Android is doing a good job of catching up. Sad but true the Touchpad has more apps than the Playbook, and that thing didnt survive 2 months in the market. The tight blackberry server integration needs to be ditched. Blackberry tends to get at least 2 outages like this a year where it basically screws up your service on your blackberry, and this is the worst one they've had yet. They should at least allow the carrier's network to be a failsafe in the event there's a failure so you can still get BBM and emails. They had their good run with getting their initial success off big business and the government. Blackberry was doing something no other company was doing (good at least) in providing mobile email services, and as smartphones improved with more PC like features they had a nice short run courting the regular consumers. Lack of innovation and gearing the market towards mass consumer has failed them. The only move that gears them towards mass consumer is heavy phone subsidies, and that's not something Blackberry could be proud of, that's something carriers have to do to offload the devices when they stop selling good. Don't blame anyone of the CoCEO, they may want the company better, but can't reach the target because of the enterprise culture, like I said 3 years ago, RIM is old before really grow up. Strange culture in RIM, and this culture generate self-destroy political environment. In RIM if a new hired person figure out major problem and introduce efficient approach, both manager and his buddy group member will proof their wrong approach works. just like someone point out driving a car is right way, pushing a car is wrong way, then both manager and his buddy group member will hate you, and proof that 3 person can also move the car by pushing it. cheating email will be sent to some vice president, saying like: see, the car moving, pushing a car is a natural part of the process. It is very strange company culture and strange company political environment, it promote stealing and cheating skill. RIM's management may be a typical instance in MBA course. This culture deny or steal hardworking team members' contribution/ innovation, generate strange political environment, destroy RIM. July 7th 2008 when I start to work in RIM ID group, I found RIM's CAD skill in ID group is still in low efficient level of 10 years ago, like ID changes can't be regenerated in mechanical part, so I point out the problem and introduce efficient topdown process, to make sure top level adjustment will always be regenerated in down level. But the RIM's CAD experts wrote email to 3 VPs and successfully make them believe that-----whenever top level adjust, continuously and manually audit in down level is a natural part, means low efficient is a natural part in every RIM's device design program. They abuse their power layoff the only driver, and use 3 person pushing the car, "continuously and manually audit in down level as a natural part". "continuously and manually audit in down level" is the mark of not qualified for the position, but in RIM, strange thing happened, why RIM low efficient, so don't blame CEO, the Co-CEO are innocent.